Nasgo & ShareNode being marketed as Super Bowl sponsors? Fresh from making a bunch of malarkey marketing claims in Asia, Nasgo and ShareNode have set their sights on the upcoming US Super Bowl. Nasgo and ShareNode’s business model is cookie-cutter MLM cryptocurrency securities fraud. Affiliates sign up, invest in SNP and NSG and are paid a ROI in bitcoin. Pyramid commissions are also paid on recruitment of new SNG and NSG affiliate investors. In addition to SNP token withdrawals through ShareNode’s internal exchange, NSG was recently listed on BitForex, a dodgy Chinese crypto exchange set up in mid 2018. The crux of Nasgo and ShareNode’s business model requires the company to pump NSG’s value. To that end Nasgo and ShareNode executives were recently in Asia to promote the company. At promotional events held in Vietnam, Nasgo executives told prospective investors that the company had signed agreements with the Chinese and Cambodian governments. The founders of Nasgo signed a partnership with the China government and Cambodian government to be their countries only blockchain source (with many more countries lined up). One would think such a huge announcement would make headlines in the cryptocurrency community around the world. To date though no official announcement from either the Chinese or Cambodian government regarding an agreement with Nasgo or ShareNode has surfaced. Nor has any country publicly expressed interest in Nasgo’s blockchain platform. While unsubstantiated claims might be enough to dupe gullible Vietnamese, Chinese and Cambodian investors out of their money, back in the states Nasgo needs a more… juicier hook. And so we have the Super Bowl. 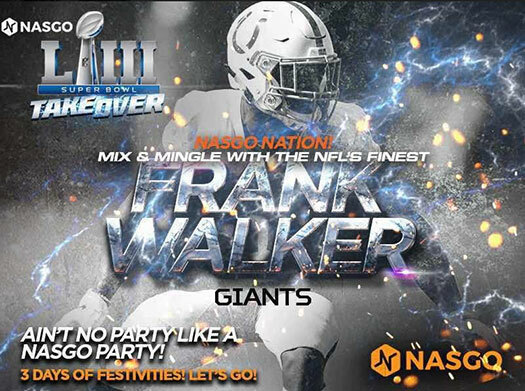 Scheduled to kick off on February 3rd, Nasgo has wasted no time planting the seed that it’s an official NFL Super Bowl sponsor. On January 31st Nasgo published their own spammy press-release. At the Super Bowl, the companies will be hosting 20 celebrity guests in a VIP Suite to experience the VAPR augmented reality app during the Super Bowl game. VAPR, a tokenized application available from ShareNode, adds enhancements, bonus information and another level of experience to major entertainment and sporting events. The two companies will also be broadcasting the VAPR support to social media during the game, to showcase the VAPR capabilities as an easy-to-access and available marketing and engagement tool for every individual and business that tokenizes content or loyalty and marketing material via the NASGO platform. All Nasgo and ShareNode have done is use investor funds to buy a VIP Suite, in which they’re going to run their VAPR augmented reality app. There is no Super Bowl sponsorship. Unfortunately that hasn’t stopped desperate Nasgo and ShareNode investors from running with it. 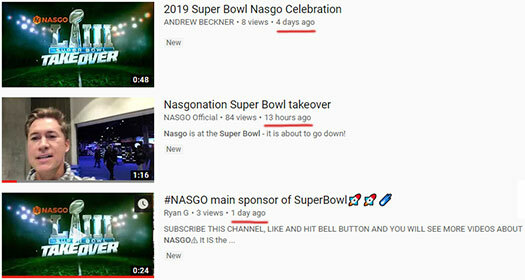 First off Nasgo undoubtedly doesn’t have broadcast rights for the Super Bowl, so they don’t have permission to stream any Super Bowl footage on social media. Unless they go the illegal stream route, whatever Nasgo streams over social media is going to be heavily restricted (i.e. you’re going to miss out on the actual game if you bother). Secondly it’s highly unlikely Nasgo has permission to use NFL branding or player likenesses in their advertising. Which means they’ve left themselves open to litigation should the NFL push it. VR Drive-In,” where fans can “ride” to Atlanta from a variety of locations around the country via a Ford truck and virtual-reality goggles. Outside of the paid actors Nasgo sets up in its booth, nobody at the Super Bowl will be interested in or even know about their VR app. And finally, another official Super Bowl partner, Visa (yes, that Visa), is signed on to sponsor the event till 2025. While Super Bowl LIII won’t be cashless, Visa, the official financial partner of the NFL, has announced this week that they envision a cashless Super Bowl before the current sponsorship contract expires at the end of the 2025 season. 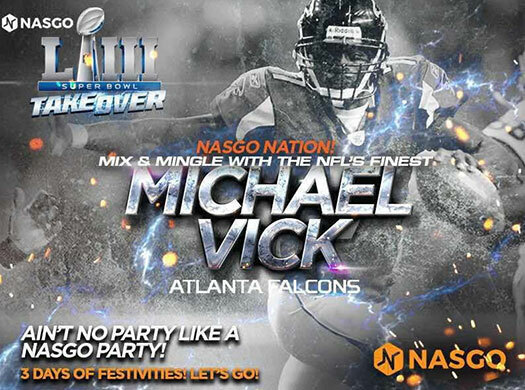 But uh yeah, here comes Nasgo with their blockchain technology… ready to revolutionize the Super Bowl from their VIP booth. At the time of publication BitForex have NSG listed at 0.000164 BTC, down from an initial pump of 0.000174 BTC in early January. Neither Nasgo or ShareNode publish the internal value of their non-publicly tradeable SNP Ponzi points. Seems they are taking a page out of Ryan Conley’s FutreNetPro claims at the last Super Bowl. Wonder if he gave them the idea? After all he is pimping this big-time now that he was kicked out of FutureNetPrro. Getty Images / ESPN called. They want their picture back. So they used I guess your funds and other members funds to rent a suite at Super Bowl for friends, I’m not a paparazzi but I didn’t recognize one celebrity in that suite unless you count Larry King’s Wife. What a great use of your funds, to film themselves ina suite to raise more money from other investors who don’t know any better.